The hype around Samsung's next highly-anticipated flagship is at an all-time high and various leaks and rumors keep flooding in. The enthusiasm in really overwhelming and there's enough new info to feed the fire. From what we have heard the Galaxy S6 will be a truly impressive device, especially in terms of hardware performance. Today brings a new AnTuTu benchmark leak which is slightly different that the once we have already seen, but more importantly this time it is accompanied by an alleged test score. Rumors of Qualcomm loosing a major customer in the face of Samsung seem to bear a lot of credibility as the Korean giant will most likely rely solely on its Exynos SoC for the Galaxy S6. 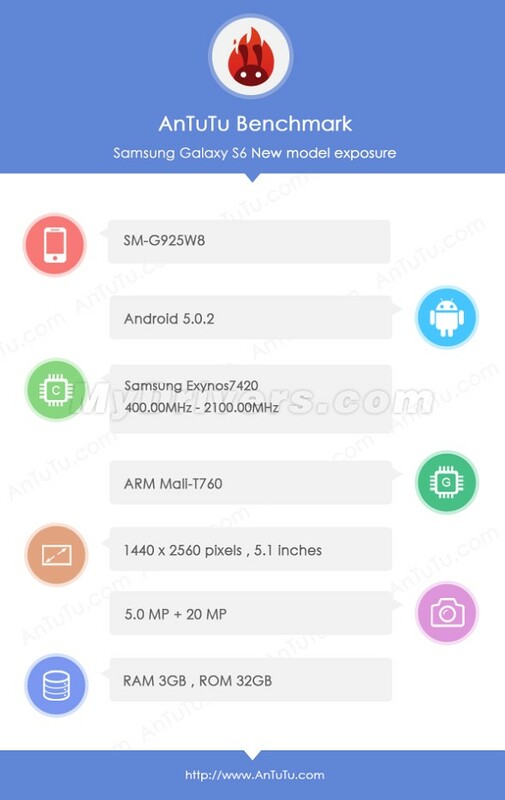 The in-house silicon in question should be the Exynos 7420, complete with 3GB of RAM and a Mali-T760 GPU. This is pretty apparent from the leaked specs sheet and coincides with previous rumors.. Looking at the test results the octa-core Exynos 7420, clocked at 2.1GHz is definitely a beast and crunches numbers like nothing we have seen so far. The Samsung Galaxy S6 managed to earn a 60,978 Antutu score. This is way beyond anything that has been achieved to date with a Snapdragon 810 or a Mediatek CPU for that matter so Samsung may have a firm lead on performance with their new chip. The impressive performance of the four Cortex-A57 and four Cortex-A53 CPU cores surely comes at price, namely higher power consumption and heat output. Samsung may have employed a 14nm production process in the chip, which could definitely account for some of the performance boost. Nevertheless the Exynos 7420 looks like an unbelievable powerhouse and these AnTuTu results only prove the amazing Geekbench performance we saw from the chip a few days ago. Hopefully the new Galaxy S6 and its edged variant ca translate these numbers into amazing real-world performance. For now we can just wait until the devices hopefully become a reality on March 1 at MWC.